The Fastest Prints In The West! You want your outdoor sign to get attention. But the kind of attention you get may come from the kind of outdoor sign you use. Feather banners, also known as feather banner flags or teardrop banners, are an increasingly popular option when it comes to outdoor signage. By comparison, A-frame signs are relatively traditional. We’re talking about the sandwich board signs you’ll see balancing on the sidewalk in front of some businesses or events. But this distinction between each is not so simple. 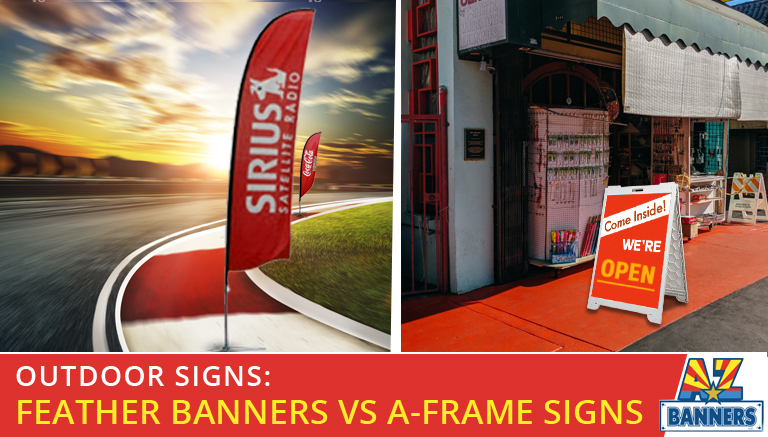 There are distinct benefits to both the A-frame sign and the feather banner. It’s worth taking a deeper look to explore them. Join us as we do just that below. Since there are some commonalities in usage between these two types of signage, we’ve decided to run down how they compare on various categories. But before we do that, let’s see what these types of signs represent on their own. Many people like to use feather banners to promote special events. That’s because these signs have a visual pop to them that makes them stand out from their surroundings. Feather banners are also easy to install and durable. A-frame signs communicate a more intimate message than their feathery counterparts. Conventional wisdom on A-frame signs is that they are good for helping to spread word of mouth right on the ground. If someone is passing by a business or event with an A-frame sign, the sign could be the element that pushes their curiosity over the edge into attendance or patronage. How do feather banners fare against A-frame signs when it comes to weather? It’s a trickier question than it might seem. You might look at a feather banner and think it would be flimsy, that it would tear with the slightest amount of wind and not hold up against the elements. But we use tear-resistant nylon and a high-quality screen printing process to construct our feather banners. These factors protect the banners against destruction. A-frame signs have a heft to them that’s hard to deny. One threat to their integrity is water, but that’s mostly when it comes to wooden A-frame signs. But we avoid that problem as well, not only with high-quality construction but also with the ability to replace the insert in your A-frame sign over and over again. Whether you prefer an A-frame sign or a feather banner visually will come down to your personal taste and the purpose of your sign. Feather banners provide excellent promotion for grand openings, at trade shows and special events, and for business like gyms, restaurants, and automobile dealerships. Any place or event that wants to communicate with energy in its message will find a feather banner useful. By deploying these signs, businesses can increase their foot traffic and deliver information in a dynamic way that engages potential customers. When it comes to A-frame signs and feather banner signs, there’s no clear better option. The one you choose is all about the goals you have for your advertising and what the business or event is that you’re advertising. Simply put, you want a feather banner for attention-getting, and you want an A-frame sign for customer engagement. Check out our other outdoor advertising solutions to get even more help with this complicated issue. Not sure which types of discount banners and signs would work best for your business? Call the experts at AZ Banners today at 480-458-8128. Our knowledgeable staff can help you through the process and provide quick turnaround on your orders! We have become the primary source for signs and banners in Phoenix and the surrounding area. Our customers tell us that they appreciate our fast turnaround, ability to ship anywhere and personal attention to every order. Our quality and pricing result in a great value to every customer we serve. Call today to place an order, get a quote or discuss your sign and banner needs. © 2009-2019 azbanners.com. All rights reserved.